Plastic Free July: I’ve Made My Pledge, What’s Yours? When it comes to making a positive contribution in the world, nobody can do everything, but everyone can do something. How big or how small that something is, well, that depends. It depends on so many things: the time we have available, our family commitments, energy levels, where we live, the resources available to us, and more. Better to make just a single change than to do nothing, simply because others are doing more and we feel that our contribution is small and insignificant. Millions of small contributions add up to make a huge positive impact. If we can only make one or two changes, then let’s go ahead and make those changes, and be proud of what we are doing. But let’s not get complacent. Usually I say: whatever we can do, that is enough. And I do believe that to be true. But I also think there’s a time and a place to re-evaluate and ask ourselves the question: is there something more that I could do? I think Plastic Free July is the perfect opportunity. I first took part in Plastic Free July in 2012. (The challenge, if you’ve somehow missed hearing about this great campaign, is to refuse all single-use – or even better, all – plastics for the month of July.) Of course, that first year was a challenge for me (but isn’t that the point?!). The second year wasn’t without its trials. But by the third year, I’d pretty much got my plastic habit under control. I had two choices. I could sit there smugly, applauding myself on how far I’ve come. Or I could look at my current routines and habits, ask myself: is there any room for improvement? Guess what?! Unsurprisingly, there is always room for improvement! Nobody’s perfect. Firstly there are always the exceptions that can be tackled. Then there’s the stuff that was too hard or not possible last year – maybe something has changed since then? Even when things seem good enough, there is always room to adjust and do things slightly better. When we fostered and later adopted our greyhound last July, I wrote about whether we could have a dog and be zero waste. 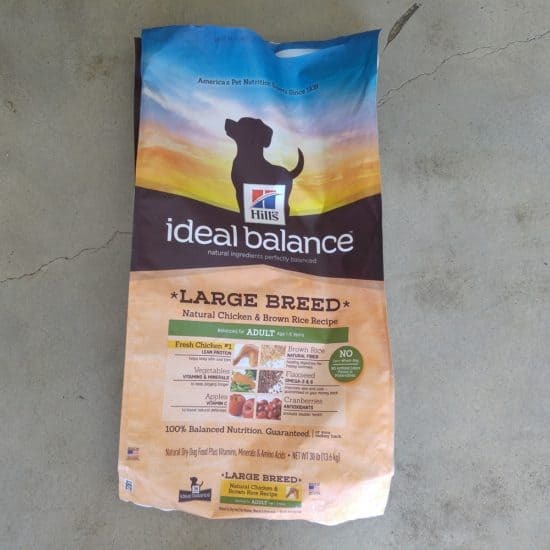 My biggest challenge was and still is dog food. We have been buying the big 20kg plastic bags of dog food. I’d love to make my own, but when I first looked into it, I ended up feeling overwhelmed. I put it on the backburner. On the backburner is where it is still sitting. At the time, it wasn’t a cop-out. Having a dog was something completely new to both myself and my husband, and we needed time to adjust. But 11 months on, it’s fair to say it’s time to revisit this. Buying processed dog food, made from industrially produced meat, produced overseas, and sold in a plastic bag; that pretty much goes against everything I believe in and everything I want to support. It was a good short-term solution. But it’s in danger of becoming a longer-term one, because I’ve let myself get complacent. So for Plastic Free July this year, I am setting myself the challenge to start making my own dog food. We are lucky that our greyhound is the least fussy eater on the planet. I’m a little bit terrified of the extra responsibility, but I can read and research – and I have enough common sense. By the 1st July, I’ll have something in place. It might not work. It might be a terrible disaster. Our greyhound might suddenly become the world’s fussiest eater, or it might not agree with him (greyhounds have sensitive stomachs), or it might take so much time to source the ingredients and make that it simply isn’t practical. But I will never know unless I try. Isn’t that what a challenge is all about? Talking of challenges… now I’m going to challenge you. If you’re new to living with less waste, then I’d recommend giving Plastic Free July a go this year. If you’ve been pursuing the plastic-free lifestyle for a while, I’m going to challenge you to look at everything you currently do, and find just one more thing to try, to revisit, or improve. Plastic Free July is one month: that’s 31 days to give something a go. That’s 31 days to build a new habit, research alternatives and try something new. At the end of the 31 days, you might decide that it was all a bit too hard, and you’re not ready. That’s okay, if you tried and gave it your best shot. However… you might find that these new habits aren’t nearly as hard as you thought, and you’ve made a change that you know you will stick to. How great would that be? There’s never a bad time to embrace change, but the great thing about doing it in July is that there will be plenty of other people embracing making changes too. When I say plenty, I mean a lot. In 2016 over 1 million people took part, and 2017 is set to be even bigger. There’s nothing like doing a challenge with others to feel motivated, and being part of a movement only makes that even greater. Seriously, I want to hear from you! Is this your first Plastic Free July and if so, are you taking the no single-use plastics pledge or the no-plastics-at-all pledge? Are you returning for another year and what would you like to change this year for a month? Are there any sneaky bad habits you’d like to shake once and for all? Anything else you’d like to add? Declare all in the comments below! 55 Comments • Leave a comment! 55 Responses to Plastic Free July: I’ve Made My Pledge, What’s Yours? How are you planning on making it? We are thinking of adopting a dog in the future and working how to make dog food sustainably and cost effectively sounds like a real challenge. Looking forward to seeing how you go. Since I wrote this (so pretty much in no time at all) I already have enough to fill a blog post! But sadly no actual solutions yet… And it’s not even July! My father (a vet and former farmer) always made our dog’s food by cooking meat ( to kill worms) and adding rice. He didn’t use onions so it didn’t smell so good. Friends of mine had a large lab which ate pasta cooked with a little meat – on vet’s advice. I’ve tested our greyhound with all sorts of ingredients over the past few months, and he seems to eat anything! I’ve read that lentils are a good filler too and have more nutrients than rice. He does also like rice. He is also quite the fan of vegetables. My main issue is trying to source sustainable and ethical meat, ideally packaging-free.The thing I’m scared of is providing a balanced diet, but then I look at those gross kibble biscuits and think – surely anything homemade is better than that?! I’m working out how to lose plastic wrapping on dry goods for plastic free July. I’ve started the adventure already. The bulk store I knew about had closed so I found another branch on the web. Talked to a friend about it and she knew an organic fruit shop with bulk dry goods. They stock different things so I might alternate. PS Be careful filling a bag from overhead. I dropped chocolate nuts all over the floor! 5 second rule! Haha, luckily none of the bulk stores I go to have those wall dispensers! But I have been to stores that have, and yes it is yet another skill to master! PS I’m pretty sure the rule is 5 minutes, Ann! ;) With chocolate nuts, definitely! We’re not 100% plastic free, but we make the effort. My plans for this year’s plastic free July are outside of my own personal zone. I’m starting to make reusable pads to donate to women struggling to cope financially, and my group is spending 2 hours/week selling reusable bags outside the supermarket, and promoting plastic bag free. I hope that adequately makes up for any of my own plastic failings. I love this Anne, that is so great. I’m planning to write a post about different ways people can bring Plastic Free July to their community in the coming weeks. Is the reusable pads initiative part of a bigger project/group, or a local one? I’d love some more info if you have it? I’m going to do Plastic Free July this year for the first time and because I just don’t use that much single use plastics (except food packaging) I’m going to try to avoid plastic as much as I can. I’ve already made a lot of changes in my life and don’t have so much plastic around but I can definitely do better. I guess I don’t have any other bigger plan for this year but it is my first time so it’s enough. Maybe not plastic free July this year, but we have started recycling all “soft” plastics through Coles, on top of our normal recycling. My wife is going to make re-usable cloth bags for fruit and veg purchases. We have started making conscious decisions of what we buy based on the packaging now as well. So not plastic free, but on the way. Sounds like you’ve got loads of great ideas, Mel! Good for you for getting rid of the “just in case” bags – it’s very freeing ;) It always amuses me when people come to my house to buy stuff off Gumtree or for whatever reason, and they ask if I have a plastic bag, and I say no. They never quite believe me! Good luck with the Bushcare group – I think Plastic Free July aligns so well with that (reducing litter etc). I think you’ve set some great goals – good luck! I’m in! I want to start making my own dog and cat food alao, but I’ve been putting it off for years. I have found your site so helpful and inspiring in trying to reduce my plastic use and trash overall. Thanks so much! Hurrah! That’s great Cari! I’m a little bit scared about the dog food situation, but I hate that kibble so much also. I’ve been trying some things out this week already. My biggest fear is that we will underfeed him, which we obviously won’t know until he loses weight. Or the opposite – he balloons! Good news is, he eats everything. He even decided yesterday that he wanted to eat lettuce leaves (because we were eating them) so we gave him one and he gobbled it up. Crazy dawg! I am moving to another country in July, so double challenge! My next home does have a zero-waste shop, so I’m excited. Plus many markets I’d like to try. Keep up the good work, and thanks for the post. I will encourage all my friends to take the challenge. I am currently organizing a little meeting in my town to make people aware of this great initiative. I am currently working on a Power Point presentation and am bringing plenty of plastic alternatives to every day objects to show people. Needless to say that your blog gave me plenty of ideas and solutions! Thanks!! I hope the meeting will have a positive influence and at least will make people aware of the plastic involved in our lives. As for my personal plastic free july, I will try to do my best and improve! My goal will be to buy as many items in bulk, which is not an easy task where I live. I have been wondering about this for a long time. I have essentially eliminated all plastic from my life except for stuff which I have to buy now online, but I have been buying cans of beans and glasses of peas, etc, so I can make some improvement regarding that. Another thing but it’s connected that I have a longer project in mind starting next year, namely to tour the world by bike which will last for years and don’t really know when it will end, so I really have to compromise on zero waste a bit, since I won’t be having a blender and jars full of seeds on my bike :) Since seeing the world by bike is more important for me, I hope I won’t get an inner conflict about it and maybe even be a zero waste ambassador of some kind around the world, promoting it exspecially in Asia where I will spend the first few years. Actually I would be grateful for some tips about how to live on the road with minimalist equipment, when I will be only using a tent, hostels and couchsurfing sofas to sleep. Hi Dori, I’m so excited about your trip! It is going to be so awesome. I think you’ll find it easier than you think. And I think too much focus is sometimes given to pantries in the zero waste world, and less to all the other waste-less things we can do – like travelling by bicycle, slow living etc. Are you on instagram? I have a friend who is currently walking 4000km across Europe whose name is Maitrijournal (well his actual name is Trent.) My husband tells me he is on Facebook too but I haven’t looked! He’d have plenty of tips for travelling light – he’s a minimalist and very conscious of waste. He’s doing camping and couchsurfing all the way. One tiny problem I have, when I share it on facebook, the image is not showing, would you know why? I am brand new to this! My goal will be no plastics but am guessing it will be a journey. I have started buying a few items to make this easier. Making my own dog food is a bridge too far but I will make progress! I’m starting to feel that making my own dog food is a step too far for me! Our kitchen looks like a bomb site, and I feel like my calendar is blocked out with “cook dogs food” whilst I’m grabbing toast for me! Still, I have until 31st July to see it through and decide if it’s a habit for sticking or not. Another great post Lindsay. I would like to sign up this year, we are going abroad for the first 2 weeks and I am wondering what to take on the flight to recent single use plastic. My reuseable cup is stainless steel do you think these are allowed? It will be empty at security but I wasn’t sure if it would be acceptable, not being a well travelled girl any suggestions would be welcome. Thanks Wendy! I take my glass KeepCup on flights (and before that I took my plastic one) and it has always been allowed. I really appreciate having a hot drink in a cup with a lid – why are plane cups so ridiculously shallow and wide? It’s nice not to wear your drink! I also use it for other drinks, if I have them – but I tend to stick to tea and water. I also take my stainless steel Klean Kanteen water bottle, empty of course. That is great too as I give it to the staff and they fill it up, so I don’t need to request glasses of water every 3 minutes. I have flown with Emirates in January to Dubai, and I of course refused that little plastic tub of water (they put water in a container like a joghurt! ). I asked the stuff, and I was shocked to learn that everything they hand out and not used up is thrown into garbage.. no recycling either. The water had an expiration date of somewhere in 2018, and the packeged cookie was still good for another few months, but that was the policy.. I have been meaning to write to them, because this is crazy, now that I reminded myself of this I think I really should, although I’m not sure anything would change. Hi Lindsay, I know it’s a bit of a treck for you but i wonder if Beef Natural in Mundijong would be able to supply you with the meat your after? They farm biodynamic and organic beef and sell direct to the public… however ordering online you only get the option for buying the better cuts. The product is also supplied prepackaged but it might be worth talking to them about other options? The owners are really lovely! Thanks for the suggestion Emily :) Mundijong is quite far, and I will exhaust all the local options first but I am open to all ideas! Hi. Does anyone have any ideas about how to buy shampoo and moisturizers etc without using single use plastic ? For moisturizers, I use almond oil, which you can buy in glass and lasts a long time. If you’re not game to try bicarb (or rye flour) and vinegar (!) I’d suggest shampoo soap bars. There are a number of companies that sell them: Lush, Ethique and Beauty and the Bees are all brands that I’ve had recommended to me. My husband was given the beer shampoo bar as a gift and really liked it. You might find a local seller has some on offer so Id recommend checking out local markets too. Alternatively, lots of stores offer bulk shampoo options (where you can refill your own container) – some bulk stores and also health food shops so maybe see what you can find locally. Hi Glenda, that sounds great! Most of those things are pretty low effort to make I find (for anyone reading who thinks that sounds daunting!) – like you say, it’s just the habit of setting a little time aside – or remembering to soak things, or remembering to ensure you have all the ingredients! Another dog meat suggestion – chicken necks. Even if you don’t find them to meet your ethical standards, they’d likely be a great zero waste option as they are otherwise a waste product. I know my parents’ dog LOVES them! For me, since returning from travels, my focus is on reducing plastic bottles in the bathroom. So it’s more a ‘use it up’ challenge first, before alternatives are sourced and bought. I taped a square on the bathroom ledge and there’s 5-6 varying sizes of bottles of moisturiser to ‘use up’. Daily, I have a bedtime check list for good habits (tablets taken etc) and added ‘moisturise’ to it! It can be face one day. Legs another. Even elbows. Just USE SOME! Oh, and I bought a second hand ‘quick meals’ cookbook, so perhaps pick some recipes and reduce the freezer meals, which I know will please you. Hi Sarah, arghh, chicken necks! Went to the butcher at the weekend, had a great chat to him about pet options and zero waste. He told me that a few years ago he’d get one person a month bringing their own containers, but now he gets 4-5 a week! Anyways, chicken necks. Bought some, put in fridge, was scared to fee to Hans in case he swallowed whole and choked. Eventually mustered up the courage – and he swallowed whole! Silly dawg! Fortunately he didn’t choke. Take two tomorrow morning. I’m seeing why everyone feeds their dogs kibble! Ugh, using up is the worst – but so satisfying when it’s done. It took me 18 months after going plastic free to “use up” all the bottles in my bathroom. Why I thought I needed so much I’ll never know. But I was sooo guilty of taking all those fancy counter samples. Forcing myself to actually use them was so traumatic I’ve never been tempted again! So I feel your struggle… Good luck!!! I have been slowly redusing my waste and plastics for about five years. Some seasons have been better than others. In my town it takes a lot of effort to try to buy food and consumables without packaging with using a bike and living 5 km from the city. I have never participated to a plastic free July but will do it this year! I already try to do the things in the Action picker so for me the goal will be minimizing my plastics and overall waste. Quite a bite of our waste is created because my husband is not so passionate about redusing waste even though he is actively and awsomly onboard with it now days. However for the following week my husband is out of town so now is the chance to see how much plastics and waste I am producing when living alone. So my goal for plastic free July is to minimize MY waste for the following seven days (in June :) This will be so interesting!!! Thanks Krista! Love your dedication :) Glad to hear you’re joining Plastic Free July this year. It’s great to be part of a movement with so many other people doing the same thing – it really feels like the energy and enthusiasm is building. Last week was very interesting! I produced 53 pieces of waste even though I payed a bit more than normal attention to reducing my waste. I am a bit sad with my final count. But this is the first time I’m actually looking into my trash so all in all it is a good experience. I will make a experiment for the current week by having my own trash can separate from my husbands trash. After the experiment I will know is it functional to have my own trash can for checking my personal waste. Thank you for being able to post this list. It felt good to feel accountable of this challenge through my comments on this post. Happy plastic free July to everybody! plastic free july is indeed looming closer! we have a cat since december, but she’s pretty old and still getting adjusted to us, so I wouldn’t want to try to cook for her yet. Maybe next year!? Instead, I would like to focus on an area in which it has been tough for me to reduce plastics: DAIRY! Whether cheese, yoghurt, milk, quark or cream, we consume a lot of it, all in single use plastic. So this month I will explore packaging-free ways of purchasing dairy products. I wish you all lots of success with your challenge-s! We’re a vegetarian family of 5 who are always looking to reduce our plastic and waste in general. 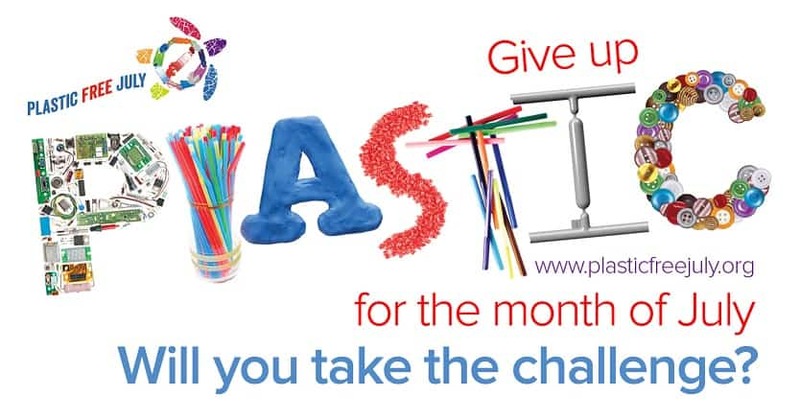 This year 2 of our children are old enough to join in the challenge (or at least understand the general concept), so we are committing to take the Plastic Free July Pledge with you! I think our hardest challenge will be dairy as well but are exploring all other options. We already do Car Free Fortnights every school holidays (which the kids LOVE), and are hoping at the end of July we’ll be able to make a presentation to their school explaining the Plastic Free Pledge and how we got on as a regular everyday family. Long term I”m hoping their school might be encouraged to expand their already pretty low waste way of being and add plastic free to their vege gardens, solar panels, and composting system. Even if we can inspire one other family it’ll be so worth it. Wish us luck! Hi Lindsay. Just stumbled your blog recently. Thanks for the post! I also live in Perth and adopted our greyhound Angel a year ago. I have been on the zero waste journey for about as long, but find dog food to be painful when it comes to reducing plastic! He just doesn’t like the mince that we were told to feed him. He does love cooked chook mixed with kibbles, but I haven’t found a place near me that sells package-free kibbles. Your post has inspired me to keep looking for a solution. Thanks again! you might consider using the bits of meat animals that don’t sell well. chicken hearts and gizzards or beef tongue, for example, are nutritious as proteins, but are sometimes wasted. you might consult with dog’s veterinarian to help you make a recipe that is really nourishing. much easier to make dog food than cat food. as obligate carnivores, cats need a much higher level of animal protein than dogs and have some special needs, like for taurine, that make it difficult to make a homemade diet. good luck with your pup’s diet. I’m exctied to participate in my first Plastic Free July! I also got my husband very exctied about it as well. We are going on a honeymoon roadtrip across the US for half of the month and we’ve been having a good time thinking about how we are going to do that and alternative gas station stacks. There are some things I don’t think we will be able to give up (motor oil in bulk?) and there are some photography related things we will still get- as it is a photo road trip, but all our food and as much else as possible will be plastic free!